The Galaxy S9 and Galaxy S9+ are minor upgrades over their predecessors. The new Galaxy flagship smartphones retain the same design language of last year’s Galaxy S8 and S8+ while introducing many incremental changes on the inside. Even with the improved cameras, stereo speakers, AR Emojis, etc., the Galaxy S9 and S9+ are not very different from the Galaxy S8 series unless you specifically need those new features. With increased saturation in the premium smartphone segment, selling large quantities of the Galaxy S9/S9+ was always going to be a challenge for Samsung. At the time of the launch, DJ Koh, CEO of Samsung’s mobile division, expressed confidence that the Galaxy S9 will outperform the Galaxy S8 in sales. While Samsung hasn’t released any official sales numbers for the Galaxy S9/S9+ so far, Canalys has come out with launch-month shipment numbers for the new Galaxy flagships. 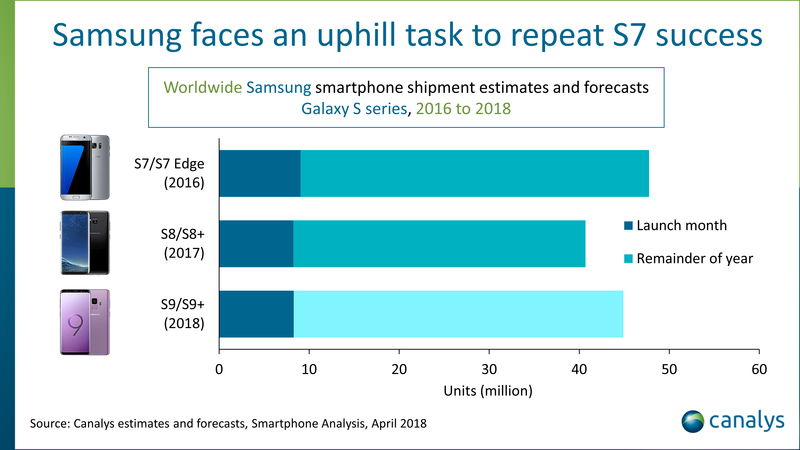 According to Canalys, Samsung shipped over 8 million units of the Galaxy S9 and S9+ in the first four weeks after launch, which closely matches with the launch-month shipment numbers of the Galaxy S8 series but falls short of the Galaxy S7/S7 Edge’s 9 million mark in March 2016. Out of the 8 million Galaxy S9/S9+ shipped worldwide, the US accounted for 2.8 million units while South Korea clocked close to 1 million in shipments. Between the Galaxy S9 and S9+, the latter fared better in shipments, due to the dual-camera setup which the smaller and cheaper Galaxy S9 lacks (bigger phones anyway tend to do better in general in many markets). Canalys attributes the relatively good shipment numbers of the Galaxy S9/S9+ to the wider availability of the smartphones at launch, aggressive trade-in programs, and generous discounts. Remember, these are not official numbers from Samsung and so may not be entirely accurate. However, given the reluctance of Samsung to share sales information for different models, reports from market research firms like Canalys are still our best resources on this subject.